I have written a lot about millets in my earlier posts on how to cook millets and other millet recipes. Millets are gluten free, high in fiber, phosphorus and very nutritious. My wish is to inspire others to start cooking healthier, so that we all can live a disease free and happier life. 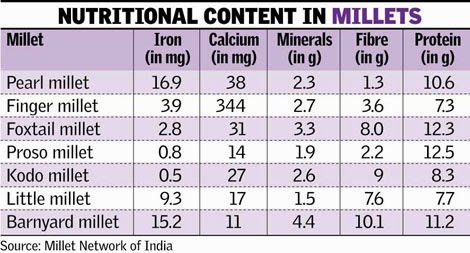 I bring to your attention, the chart below about the nutritional content in millets. We need to know their nutritional content in order to motivate ourselves to include them in our diet often. From the chart below, we can see that 100 grams of finger millet (ragi) has 344 mg of calcium. Finger millet has the highest calcium content among all the food grains. In wheat and rice, it is below 50 mg. No other food grain has such a high nutritive value. Millet is naturally high in protein and antioxidants and can help control blood sugar and cholesterol. Including millets in your diet will go a long way in improving your health in general. So let's try to include millets in our diet often. 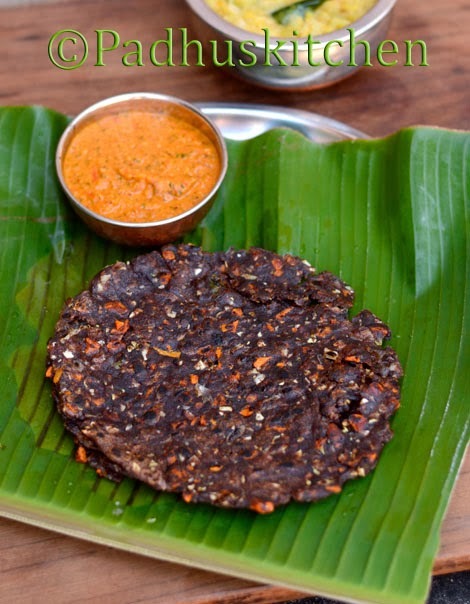 Today we will learn how to make Ragi adai with Vegetables following this easy recipe. If you take 1 cup of ragi flour-total vegetables should be around 1/2 cup, otherwise you will have difficulty in spreading the dough and cooking it. Finely chop all the vegetables including green chillies and onions. Heat 1 tsp of oil, add finely chopped onions, green chillies and saute until onions turn transparent. Then add carrot, cabbage, salt needed and cook for a few minutes covered. Since we have chopped the vegetable finely, it will not take more than 5 minutes to get cooked. Leave it to cool. Once it cools, add ragi flour to the vegetables and mix well. Add little salt as we have already added salt to the vegetables. Add water little at a time and make a dough. Divide the dough into 6 equal sized balls. Grease a plantain leaf or a ziplock bag with oil and flatten the ragi dough ball with your fingers. Grease the tawa and heat it. Transfer the flattened dough to the tawa. If you have used plastic sheet, transfer to your hands first and then place it on the tawa. You can flatten the dough directly on the tawa also. If you are flattening the adai directly on the tawa, switch off the flame, flatten it and switch on again to prevent your hands from getting scorched. The dough will start changing color. Drizzle oil around the adai and cook both sides well on medium heat. Ragi adai should be served hot from the tawa. You can have any chutney or sambar as side dish for this adai. me being ragi lover hv to try tis for sure..
Nice one.. I am going to try this.. Very nice presentation. Easy to follow. Came out very well. Thank you so much dear. tried and it came out very well..
You can grate and add. A tsp of pure ghee per day is not going to do any harm.Buy good quality ghee. I have not tried it but I think you can make it.